As you may have heard, Citi Bike is launching Memorial Day weekend in New York City with 10000 bikes and 600 stations. One of the surprising reactions was about the loss of on-street motor vehicle parking, one of the common complaints when any bicycle infrastructure is proposed. In the above video, almost everyone had a vaguely “good riddance” attitude toward parking! Any New Yorkers out there in readerdom who want to chime in? Let’s hear your thoughts in the comments below. OK… I’m only just now getting caught up with the world around me… seems I was operating in a ‘bubble’ when this article first broke. And ignorance was bliss… but my mom called and had questions about my reaction to the latest bike news – that the mayor plans to implement bike tolls and fees and licenses…. making Chicago truly the most expensive city! 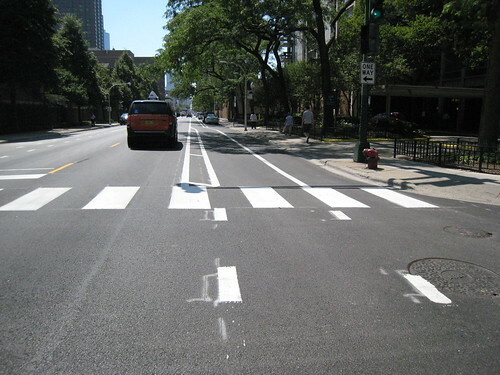 (not nickel and dimed – but rather dollared to poverty) Someone’s gotta pay for painting those bike lanes… right? STOP! •Hefty city bike parking fees, like the city parking meter fees, easily enforced as bikers “park” in city bike racks. No sticker = big tickets. And if you don’t pay, there’s always the bike boot. •And my personal favorite: the Rahm-PASS. Fixed to the bike’s handlebars, the Rahm-PASS transponder would be like the I-PASS for cars on state tollways. Cyclists would cruise underneath strategically situated girders over street corners with heavy bike traffic, and they would bypass (or Rahm-PASS) the bike tollbooths run by grumpy political workers. I’ve been walking to work from the train for seven years. I don’t need one hand to count the number of bicyclists that have stopped for a red light at a crosswalk out of the hundreds I’ve seen. We need to ban bicycles so the streets are safe for pedestrians. Save us, Rahmfather! Paul G.
Dear Paul — We don’t want to ban bicycles. We just want to tax the heck out of them, because A) bike riders during rush hour are annoying, and B) they’re an untapped revenue source, and our politicians have needs too. In response to this article, a couple of journalists were quick to write responses, including Chuck Sudo of Chicagoist.com and Whet Moser of Chicago Magazine’s Staff Blog. “There are legitimate discussions to be had about whether separate bike lanes actually make for more and safer cycling. There’s an even better one to be had about cyclist education and enforcement—in an excellent post, Brent Cohrs discusses a point I’ve made before, that driver education in America essentially ignores cycling to the detriment of cyclists and drivers. Compare that to the Netherlands, where bicycle road tests are mandatory. On a side note, I’ll be taking the League Cycling Instructor class this fall specifically so that I can learn to teach others how to ride a bike and how to do so safely. He also points out that Rahm is following his predecessor’s – Mayor Richard M. Daley’s – precedent of being a champion of bikes and bike lanes and infrastructure in Chicago. There’s already chatter among the Chicago bicycling community via the online community The Chainlink. As commenters (and cyclists around Chicago) are quick to point out – this article by Kass is just a “joke” and no actual plan is in place for any of his proposed measures to have bike tolls or mandatory bike stickers or bike parking fees. According to a National Highway Traffic Safety Administration survey, 24 percent of Midwesterners ride a bike at least once a week; and 71 percent of Americans would like to bicycle more, but fewer than half feel that their community is designed for making biking safe. 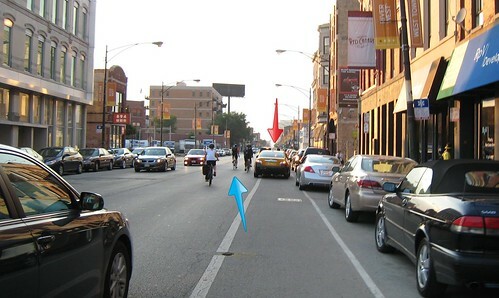 Most Chicagoans avoid riding on city streets for fear of their safety. We need safer streets for biking in order to access jobs and basic services in our communities. Biking also provides a rare opportunity for healthy physical activity in our busy daily routines. The 100 miles of protected bike lanes that Mayor Emanuel is adding will enable thousands more Chicagoans to get out of cars and onto bikes and, by giving bikes their own space, will make streets more orderly and safer for everyone. But 100 miles is less than two percent of our street network, and cars still get to use streets with protected bike lanes. For about the same cost as just one mile of freeway, Chicago can build an entire city-wide network of protected bike lanes. This could provide safe and easy access to a healthy, affordable and convenient form of transportation that our neighborhoods need. It’s a wise investment for Chicagoans and our neighborhoods. My question is – does Kass really believe the rhetoric he writes or is his column a journalistic ruse to generate controversy and talk for days? car parked in the bike lane (bike backlash?) - no ticket??? 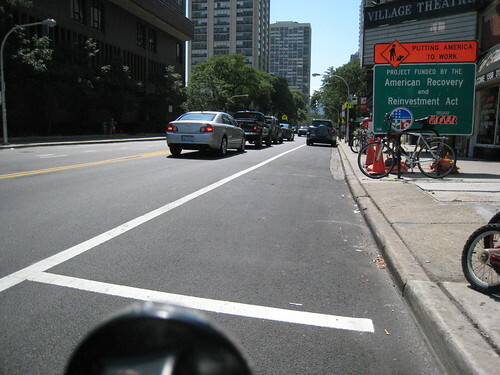 Clearly the battle for the road surface continues and there is a perceived “backlash” here in Chicago. We’ve written about backlash before in a number of articles. It seems that once a city really starts getting a lot of infrastructure in place, and people using those facilities, the backlash begins. Is it jealousy from other road users (those stuck in traffic jams as we cycle commuters happily zoom by)? We’d sure love to hear your thoughts about what you think is the motivation behind these backlash attacks against bike/ped infrastructure. We’ve covered a few positive NYC-area articles in the recent past…the Alta Bike Share program to be unveiled sometime this year, and the upcoming Bike Expo New York in the spring. We’ve also touched on the “bicycle backlash” as bike lanes and infrastructure gets installed on the streets of the Five Boroughs. You can read the full rundown of proposed legislation and find links to two interviews with Vacca by clicking here. Many of the legislative proposals target delivery cyclists…but it is unclear if that includes bike couriers. Obviously, ALL cyclists stand to be affected in some way by these proposals. Some of the proposals make sense, but as various news articles and bike advocates suggest, perhaps a similar focus should be committed to cracking down on vehicular scofflaws instead of blindly targeting only the two-wheelers. If you’re an NYC resident, we’d love to hear what you think about these proposals and the perceived “backlash” as the city steadily becomes more bike-friendly.